It's been a great week for people who find it funny when something sounds a bit like another thing that's a completely different thing: Microsoft's new boss's surname is almost, but not quite, the same as the tasty chocolate spread Nutella. That's certainly good news for hilarious internet commenters, but is it good news for Microsoft? If you're unfamiliar with the CV of Satya Nadella, allow Kane Fulton to enlighten you. 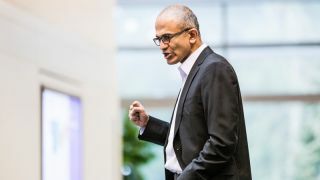 "Nadella is only the third CEO in Microsoft's 38-year-history after Bill Gates and Steve Ballmer," he says, and until now he's been in charge of Microsoft's Cloud and Enterprise Engineering Group. He's been with Microsoft since 1992, and Fulton reckons that he "has the DirectX factor in the eyes of the board." But "what has them singing his praises?" Dan Grabham can answer that one. "Nadella is inheriting a changing and challenged Microsoft," he says, and "Nadella is the guy to fix these problems." The return of Bill Gates, who will be helping Nadella in an advisory capacity, is "surely just a show to investors that the original Microsoft's strengths are still there": Gates "has always been a supreme influence over Microsoft, even since his semi-retirement". It's traditional for tech CEOs to email stirring words to everyone in the company, and Nadella's email highlighted five key areas of focus. The internet of things is one of them, Kane Fulton says, and putting Nokia at the heart of Microsoft's mobile strategy is number two. Making innovation a priority comes third, seeing the One Microsoft strategy through is number four, and completely changing Microsoft's internal culture is fifth. And we thought our to-do lists were pretty ambitious. One of Microsoft's current concerns is Windows 8, which hasn't exactly saved the ailing PC industry. While Windows 8.1 addressed some of the issues that "scuffed the original Windows 8 release," as Dean Evans and Dan Grabham put it, "it doesn't do enough." Microsoft's solution is simple: free iPads for everyone! Only kidding. Microsoft's solution is Windows 8.2, which will plug the gap until the "all-new, rewritten-from-the-ground-up, cloud-embracing Windows 9" appears in 2015. It should make the Start menu simpler, deliver a slightly more polished interface and make switching between traditional and modern interfaces less jarring. One firm that won't be installing Windows 8.2 on anything is Sony, which has just announced the end of an era: it's getting out of the PC business and selling its iconic Vaio line. "It's really hard to make money out of PCs," Dan Grabham explains. "When you're a company battling massive losses and struggling with a business unit that's no longer core to what you do, then it's time to call it quits. And that's what Sony's doing." Sony's problem is simple: it makes premium products in a market increasingly obsessed with low prices. "That's a hard sell when everything underneath is essentially the same as any other laptop," Grabham says. That's a shame, because by and large "Sony made terrific machines, especially in the ultraportable segment. Sony made lightweight PCs aplenty long before Apple's MacBook Air appeared." "The brand helped make PCs fun after more than a decade of beige boxes," Gary Marshall recalls, and we're going to miss it: Vaios were "considerably more interesting than other firms' fare", and Sony is "the mad Apple, a firm that not only makes beautifully engineered, bomb-proof products but that also gets wildly overexcited and puts out really odd things for the sheer hell of it. Orange laptops! Robot dogs! Alarm clocks you have to chase around the house!" The mad products may have been in the minority, but "in most firms ideas like that would be laughed at. Sony launched them." The world of PCs will definitely be a little duller without Sony in it.